It is snowing outside today where I live, but in my craft room it's spring! 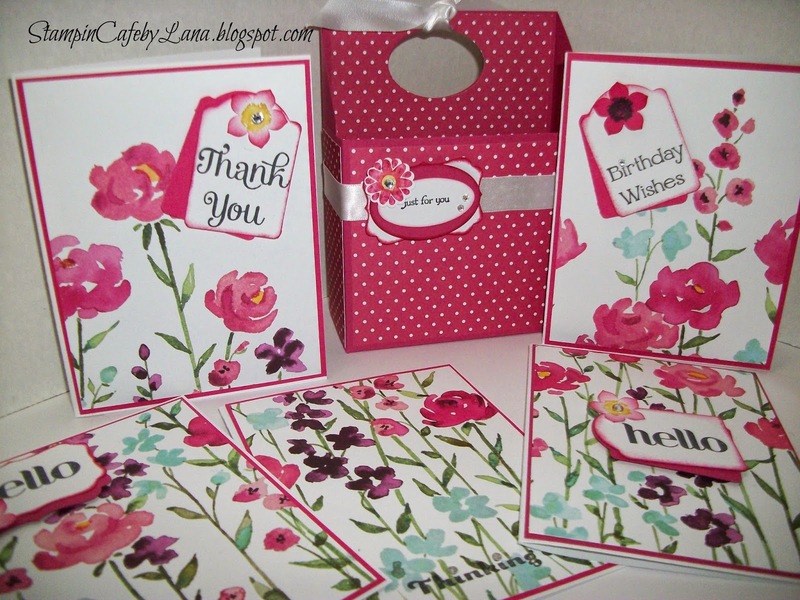 I made this set of cards from the Painted Blooms Designer Series Paper in the Occasions Catalog #137784. The box is made from Rose Red cardstock #102544 and matching DSP from the Regals DSP stack #130139. The greetings are from the Four You stamp set #130538. The box is a pattern from Pootles.UK.com. I just made it a little taller and added the oval handle. These cards couldn't be easier to put together. Even though they look hand stamped, the flowers are simply a sheet of the Painted Blooms cardstock cut into pieces. A very fun set of cards to make! I am giving this set away to anyone who hosts a workshop with me during the month of March!